When you conjure up images of European medieval woodland landscapes, as depicted in fairy tales and hero's adventures, the scenery is often an iconic archetype. The mosaic of images probably contains languidly moving brooks flanked by dense arboreal vistas and most certainly there is a vibrant lush green carpet stretching in all directions on the forest floor. This expansive and luxuriant green blanket is composed of an interwoven series of a singular and amazing plant; moss. Moss comes in a host of varieties including color, texture, geometry and so forth. The moss of fairy tale panoramas is more than likely the long-fibered sphagnum moss better known as peat moss. Peat moss is not restricted to Europe it also has its North American and Asian counterparts. Moss has a lively and lavish history in the social, medical, spiritual, horticultural and even economic realms of peoples lives all over the world. Sphagnum mosses are the taxonomical name given to living peat mosses but the more vernacular term “peat moss” or “bog moss” is what they are generically called. Peat moss is found predominantly in the Northern Hemisphere in peat bogs, moist tundra and conifer forests. Peat moss adapts to its environs by manipulating its own habitat. It retains up to 20 times its weight in moisture which means that the water is not draining away, thus, creating a bog and a vast network of mosses. Horticulturists, botanists, weekend gardeners, and florists have recognized the multitude of benefits and applications which moss provides. Along with its exemplary quality of water retention it is also known for its anti-bacterial attributes. More recently the moss Physcomitrella patens is at the forefront of research into the medicinal and healing properties of all mosses. In 2007 a consortium of scientists were able to map the entire genome of Physcomitrella patens which will certainly pave the was for more extensive studies into the remarkable benefits of moss. Nonetheless, the history of bog moss in Europe is as insightful and it is inspirational. For example, The Battle of Clontarf in 1014 which saw the King of Leinster trying to assert more muscle in Ireland by ordering his men, including Viking mercenaries, to launch assault on Dublin. Brian Boru was the reigning “High King” of most of Ireland at the time which was a loose conglomerate of independent kingdoms. The battle was won by Brian Boru as he and his men staved off the King of Leinster but at a heavy bloody cost to both sides. A chronicler of the event noted bog moss being used in battlefield triage care; “...(they) stuffed their wounds with moss.” Furthermore, it's generally accepted that during the middle ages certain peat mosses were used more frequently by surgeons on the battlefield than was previously thought. The term Blood Moss alludes to its sponge-like absorption as it was used by Hospitallers during the Crusades to soak up and halt the flow of blood. While the Europeans were cultivating and codifying their pharmacopeia of mosses the Asia was nurturing their spiritual constitutions with all things moss. The Japanese are notorious for their spectacularly manicured gardens. Theses gardens have a subtle and sensory captivating ability to lull one into a meditative state. It follows that these meditation gardens were seen as a respite from a hectic urban and or suburban life. Although Shintoism is the overarching religion of Japan, there are still remnants of Zen Buddhism which can be seen manifested in the meditation gardens. Seated meditation is one of the disciplines essential to effective zen meditation. The idea behind seated meditation is to calm both body and mind while concentrating inwardly which will bring upon insights leading to enlightenment. Japanese spiritual culture is intertwined with the ubiquity of the elemental forces like water, fire, earth, wind and “heaven” which are all part and parcel to meditation gardens. Cultivating these elements or immersing oneself into in a serene environment is at the core of Japanese seated meditation. Some of the oldest meditation gardens in Japan are designed to incorporate moss as reoccurring and thus, calming theme. 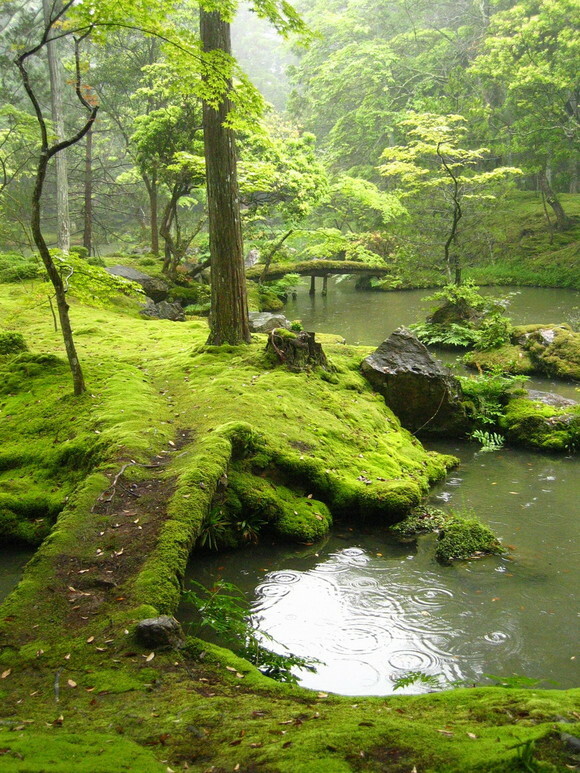 The most famous of those gardens is Saihō-ji, the Moss Garden, in Kyoto. Saihō-ji dates from around 1339 and its establishment is attributed Muso Soseki who was court politician, writer and obvious savvy organizer. Today the Moss Garden is so popular that access is limited to 90 minutes per visit and only after a lengthy period waiting for your request to be processed. This is a discernible testament to the spiritual importance of moss in the daily lives of the Japanese. Although not quite on par with zen meditation the western world has embraced the esthetic and pragmatic elegance of moss. Moss has become an indispensable gardening tool which is characteristically used today as a decorative moisture sponge which is clumped at the base of potted orchids and succulents. Any garden shop worth is salt liberally utilizes moss in their finished products. Moss is loved by florists and gardeners working with succulents and orchids because moss so readily soaks up and holds the water like a mini reservoir. This allows the orchids and succulents to access the moisture when needed while avoiding rotting issues. Soilless Planting – Succulents can grow directly in moss. Making Forms – Like succulent wreaths and topiaries. Securing Plants – Stuffing and tucking the space around the succulent and orchid roots with moss to hold it in place. Soil Conditioning – Provides moisture retention, drainage, and nourishment. Container Accent – it just looks luxurious. Admittedly, growing sphagnum moss in your Florida garden can seem like a daunting task. Florida, especially in the Summer, is not the boreal climate suited to wild moss forests. There are some ways by which you can enjoy many aspects of moss while not having to compromise on esthetics. Planting a terrarium using long stemmed moss, succulents and or orchids is one way to cultivate beauty and serenity. Visit your local garden shop for tips and tricks and many more ideas on how to enjoy the wondrous green plant Moss.